Add custom LESS code real-time and globally from the front end. Custom LESS/CSS can easily be downloaded from inside WordPress using PageLines Connect and the Extend engine. Download the plugin from the Connect store. It will now appear in your ‘Plugins’ tab. Click ‘Plugins’, and find your Custom LESS/CSS plugin (titled PageLines Plugin Custom LESS). Click ‘Activate’ to be able to use the plugin inside your editor. Go to your PageLines Builder. Hover over the PageLines icon from the front-end, where you’ll now find the LESS/CSS option. 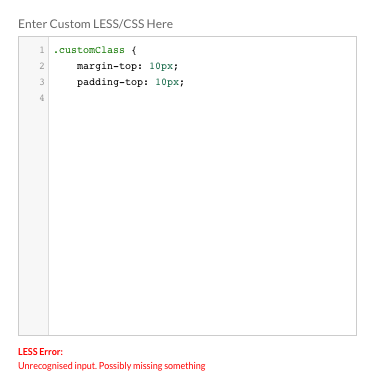 Custom LESS/CSS has no configuration options, it simply works out-of-the-box. Upon installation, a new panel is added to the PageLines drop-down menu on the WordPress admin toolbar. 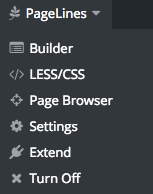 Once clicked, the builder will load a new panel page called "Custom Styling" that provides access to the Custom LESS/CSS editor. The Custom Styling editor supports both LESS CSS and CSS and allows you to add custom styles without the need of a child theme. The editor also includes basic linting capability that will analyse code for potential errors. As shown in the image below.